In an effort to bolster my uninformed takes on U.S. healthcare expenditure, quickly revealed via any debate on the dawn of Trumpcare, I decided to see how much it costs to buy some drugs in America. A search for good data led to quarterly state Medicaid drug reimbursements. Medicaid - not to be confused with Medicare - is a state and federal partnership that provides healthcare to low-income Americans. For a particular drug, the Medicaid dataset shows the number of Medicaid-covered outpatient prescriptions in a state per quarter, as well as the total reimbursement paid to pharmacies. 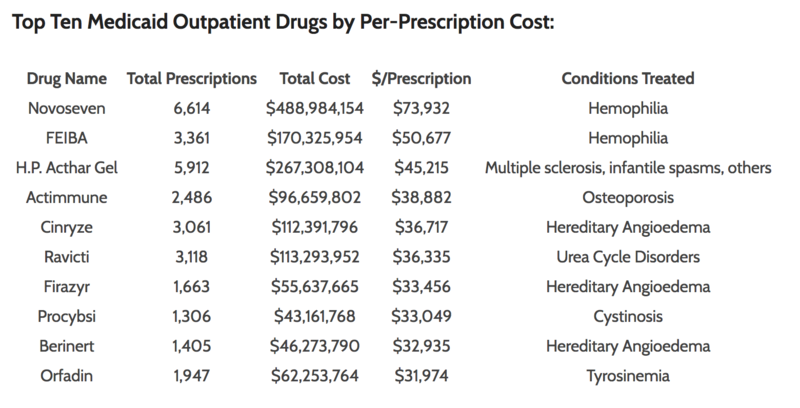 The data isn't perfect - states may receive rebates, for example, which lower the cost of a drug but aren't reflected in the data - but overall the numbers should tell us which drugs are prescribed most on Medicaid, and which are approximately the most expensive. Technical note: While the full dataset goes back to 1991, I stuck with post-2008 numbers due to a 2007 change in reporting requirements that makes trending reimbursements a little tricky. The Tableau chart below (It's interactive! You can hover to see exact numbers!) shows growth in both annual Medicaid enrollment (the bars) as well as outpatient prescription drug reimbursement per enrollee (the line). Significant Medicaid expansion by various states since 2013 is reflected in a surge in of over 10 million enrollees between 2013 and 2015, primarily encompassing low-income, previously uninsured adults. At the same time, outpatient prescription drug reimbursement per enrollee has also risen far above the rate of inflation (probably not a surprise to healthcare experts). Note to readers on mobile: I switched the Tableau workbooks to screenshots due to resolution issues. Please commandeer a neighbor's desktop or tablet for optimal viewing experience. 2016 isn't shown as reimbursement data was only available through Q3, but it appears that Medicaid enrollment has continued to grow. The sheer scale of Medicaid expansion explains why GOP leadership has been less than thrilled about any rollbacks, probably since removing health insurance for millions of voters won't help win a midterm election. Republicans may also have read this study, which found that the 2010 midterm vote share of Democrats who voted for Obamacare dropped by around six to eight points compared to peers that voted against. Basically the key to being a successful politician on healthcare is to rail vehemently against any interest group disliked by your constituents (awful insurance companies, greedy big pharma, overreaching federal government etc. ), while ultimately voting to preserve the status quo. Anyway, the next Tableau chart shows the top ten drugs by total Medicaid prescriptions since 2008. While the original Medicaid dataset was broken down by National Drug Code (NDC), a unique identifier used by the FDA, I've aggregated drugs by name in order to try to bucket similar drugs that may simply be sold under different dosages or through manufacturers (and thus different NDCs). You can adjust the ranking filter to see outside the top ten, or select specific drugs using the dropdown (the top 200 are available). These drugs are rarely mentioned in media reports naming and shaming Martin Shkreli-esque price gougers (see the next chart for those meds). Instead, they are prescriptions for common antibiotics, painkillers, and blood-pressure medication. Still, the perceptive reader may have noticed that hydrocodone and oxycodone figure prominently, aka two of the most widely-abused drugs as part of the nation's opioid epidemic (brand names for the two include Percocet and Vicodin). It's interesting to note that hydrocodone prescriptions in particular appear to have plateaued, which makes sense as states have tried to tamp down on opioids. As that Economist article details, however, a diminished supply of painkillers has led addicts to switch to heroin instead, while overdoses from synthetic opioids like fentanyl have also risen. The chart above shows the priciest Medicaid drugs by total expenditure since 2008. The clear winner (?) is Abilify, an anti-psychotic medication that saw its price raised substantially in 2014 and 2015 as it neared the end of patent protection. Interestingly, Abilify manufacturer Otsuka Pharmaceuticals is currently being sued for failing to warn North American consumers that the drug may cause a serious side-effect: pathological gambling. This case is especially noteworthy as the European Medicines Agency forced Abilify to change its warning label in Europe in 2012...yet no action was taken by the FDA until 2016. Other standouts include Harvoni, an (admittedly very effective) hepatitis C treatment, and Lantus, an insulin medication for diabetics. Why are these drugs so expensive? Mainly because they have orphan drug status. The Orphan Drug Act was a 1983 Reagan bill designed to promote the development of drugs for rare ("orphan") diseases that might otherwise have received little manufacturer attention. As detailed in this helpful guide, the Act gives a variety of tax breaks and fee waivers to spur orphan drug innovation, along with seven years of patent protection. Crucially, the seven years of patent protection can be reset if a drug can be shown to apply to an additional orphan condition for which it was not originally approved. Unsurprisingly, drug companies have been very effective at taking advantage of this reset provision. In what has been termed "salami slicing", manufacturers continually find a new orphan usage to which a previously developed medication can be applied, thus extending its patent protection at a greatly reduced cost compared to developing a new drug from scratch. An orphan drug lookup tool lists 84 drugs that have been approved for multiple conditions (and therefore multiple patent terms), including Novoseven, Actimmune, Procybsi, and Orfadin from the above list. In a sure sign of an absolutely egregious market inefficiency, even Republican senators have begun asking questions about whether the Act is negatively impacting patients. While the ludicrous per-prescription prices of these drugs attract articles from snarky bloggers like me, it is worth noting that the Act has undoubtedly helped spur treatments for conditions that might otherwise have been ignored. A compromise solution would likely maintain current incentives for initial orphan drug development, but do away with the "salami slice" loophole to prevent never-ending patent extensions for drugs have already been formulated.